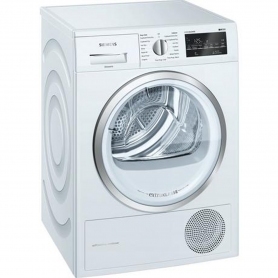 A freestanding dryer with a 9 kg capacity, this Siemens extraKlasse model is perfect for all your family’s laundry. 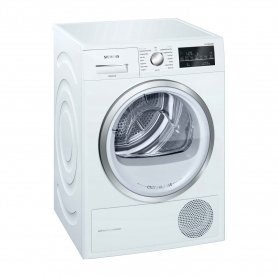 Unique to Euronics and Agent stores, the WT46W491GB features a stylish white design. The WT46W491GB is a heat pump condenser dryer with an A++ energy rating. Heat pump tumble dryers are particularly energy efficient, as hot air created during the cycle is re-used rather than being expelled from the machine. During the drying cycle, hot air passes through the drum, to remove moisture from your laundry. The hot air then moves through filters where it’s cooled, and the moisture is removed as condensation. Water is collected in the WT46W491GB’s high level container for condensed water, and then drained into the waste water. 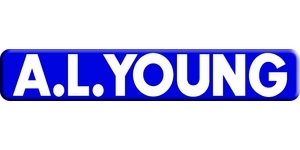 Warm air is then re-heated and circulated back through the machine to dry your clothes, saving energy. Or, if you prefer, this tumble dryer can also be plumbed out to remove the water. You’ll never have to worry about cleaning the condenser on this extraKlasse tumble dryer. A clever self-cleaning system works over the condenser multiple times each cycle – not only does this save energy, but it also keeps your dryer lint-free and in top condition. This model’s energy efficiency is maintained for life, with no upkeep required. ‘AutoDry’ sensors also feature on this model. Using these, the WT46W491GB can keep track of how dry your clothes are inside the drum, and stop the cycle at just the right time. This helps to prevent excessive heat damage. ‘ReLoad’ functions mean that you can add more laundry after the cycle has started. If you’ve forgotten an item or dropped a sock on your way to the dryer, ReLoad makes your life easier. Simply throw in the new laundry and resume the cycle. This model features a specialised programme for functional textiles, which is perfect for drying your outdoor clothing or sports kit. Get constant feedback on your drying cycle with the WT46W491GB’s large LED display. Giving updates on drum speed, temperature and remaining time, this display takes the guesswork out of your drying. You can also use the display to access additional features, such as the 24-hour delay function. A built-in drum light helps you to get a better look at your laundry. There’s even a child lock function, which prevents any changes being made to the cycle while the unit is in use. With A++ energy efficiency and a huge 9 kg capacity, the Siemens WT46W491GB is a fantastic appliance for any household. Order yours today.